There is one thing a food production company never wants to have happen, and that is to open the doors to their production facility to hear the machinery letting off beeps that only sound when something is very wrong. But that’s exactly what happened to Cayleigh Rees and Irah Vet, owners of Mexi Pops and Hornby Island Energy Bars, in their first week in their brand new 2,600 square foot production facility on Ryan Road. A malfunction in the three-phase power supply meant the freezer, hot water on demand, and other machinery was not getting the proper power supply. Without the proper power supply, Mexi Pops was at risk of losing its stock of handmade frozen treats and the machinery used by both businesses was at risk of damage. The neighborly gesture took the situation from critical to manageable and reminded both Rees and Vet why they are proud to be food producers in the Comox Valley. Now if either Mexi Pops or Hornby Island Energy Bars sounds familiar to you, it simply means you’ve already been enjoying these uniquely Comox Valley treats. Let’s start with Mexi Pops. Remember those frozen mangos and chocolate-dipped frozen bananas on a stick that started showing up in Lewis Park on Canada Day several years back? Or how about those organic fruit pops that make baking in the sun in front of the main stage at MusicFest that much more manageable? Those are Mexi Pops. Rees first got the idea for Mexi Pops more than a decade ago while travelling in Mexico with friend Haeley Campbell after graduating from high school. The hot weather meant the two young women ate a lot of frozen treats, including fruit. It was simple, delicious and healthy and together they figured it was a business idea that would work well back home. 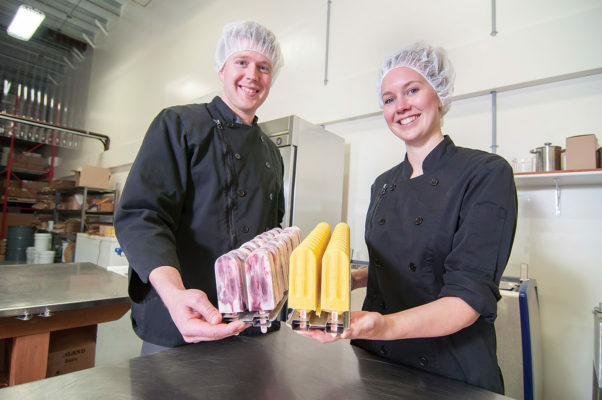 Rees and Campbell returned to the Comox Valley and started selling frozen fruit treats at local festivals and events. For the first several years, Mexi Pops was strictly a seasonal endeavor. The young entrepreneurs slowly developed a product line that included yogurt and organic fruit-based popsicles in flavors like chocolate raspberry and organic mango coconut. The business worked out of a small space on Rees’ parents’ property. Then Campbell purchased Mudsharks and moved into her own business, while Rees was able to purchase vending trailers. Her goal was to turn Mexi Pops into a full-time, year-round business that included shelf space in local grocery stores. The problem was production capacity and space. Regional events take huge volumes, and grocery shelf space requires a steady supply of product. But without proper production and storage space there was no way to do it while still meeting health and safety standards. The standards for frozen foods are extremely strict, and the product must remain frozen at all times. Any amount of thawing and the product is lost, which is exactly why the freezer malfunction was so serious. It’s a situation Vet is extremely familiar with. Vet’s mother Trish started Hornby Island Energy Balls (not bars) in 1993. She perfected a recipe of rolled oats, peanut butter, and honey rolled into a snack ball, and started selling it in carob, sesame and chocolate dipped flavors at the Hornby Island Co-op. Her production facility was a 200-square-foot shop with two counters and a sink attached to the Vet’s home. To this day the health inspector states it’s the smallest production facility in the VIHA service area. Regardless of size, Trish Vet managed to grow a successful business on and off Hornby Island. The energy balls have been available at Edible Island for years, and store sales of the energy balls at places like Seeds Market in Cumberland continue to grow. However, son Irah saw potential to grow the business and conceived of turning his mom’s recipe into a bar that could be packaged and shipped much farther than the energy balls ever could. While Trish Vet still has her regular delivery route for the energy balls, Hornby Island Energy Bars launched under Irah’s leadership two years ago, and can be found in stores as far away as Manitoba. However, like Rees, Vet had a space issue. A quick tour of Mexi Pops and Hornby Island Energy Bars new production space makes one thing clear: food production machinery is not small. Case in point is the horizontal flow wrapper, which does pretty much what the name says. Finished bars and popsicles flow down an assembly line to be individually wrapped before boxing. Imagining it in a 200 square foot space brings back memories of tiny first apartments, when it made sense to put the coffee table on the kitchen table in order to make room for the air mattress for out-of-town guests. In other words, it looks like an exercise in creative stacking and skinny thoughts. For this and other reasons, it made sense for the two businesses to share space. It doesn’t hurt that Rees and Vet are a young couple both trying to grow their businesses. Next, there’s cost. “Margins on food production are slim and it’s hard to get off the ground without sharing resources,” says Rees. Likewise, having two brands brings diversity and helps maximize production time. 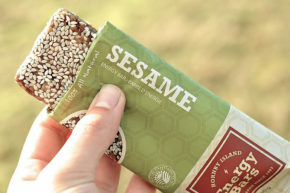 When demand for Mexi Pops drops in the winter, production of Hornby Island Energy Bars can increase and vice versa. Finally, there’s philosophy. In fact, when asked to describe their products, Vet and Rees finish each other’s sentences. “A simple, good, honest real food product,” says Vet. “And that it is going to taste like it should,” adds Rees. The ingredient lists on both products attests to this. 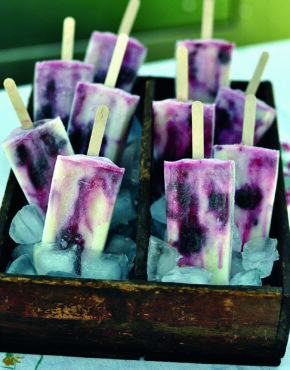 Yogurt and fruit make up the dominant ingredients in Mexi Pops and ingredients are organic and fair trade whenever possible. That sort of simplicity appeals to health-conscious consumers looking for minimally processed foods without additives. Customer demand certainly indicates the approach is paying off. The production facility on Ryan Road is a custom built space capable of producing 3,000 bars per day, though both Rees and Vet say they are not in production every day. The bigger volumes also help both businesses cut down on waste. In addition, the huge walk-in freezer allows for storage and planning, which is especially important to Mexi Pops. This has allowed both businesses to begin growing wholesale. “People want us to open a store front, but now is not the right time,” says Rees. Wholesale is an important part of both businesses current business strategy, and reflects Rees’ and Vet’s commitment to the Comox Valley. Just as importantly, both Rees and Vet have found a strong community of business mentors willing to offer support and advice. Many Valley residents do not realize the Comox Valley is densely populated with food producers. Think of Natural Pastures, Eatmore Sprouts, Tree Island Yogurt, Prontissima Pasta. And that brings us back to CTS. Rees and Vet describe CTS as a solid North Island company responsible for storing and shipping a good deal of the food found in grocery stores in the Comox Valley and farther north. They’ve been helping Rees since her early days, when she’d show up with her product in a barely running 1986 pick-up truck that staff needed to unload manually. Now both Mexi Pops and Hornby Island Energy Bars drop off their product with a cargo van, much to the pleasure of CTS. “They’ve been cheering us on since the beginning, but now I think they’re just glad they can use their loading equipment when we show up,” says Rees. It’s the same sort of encouragement Vet and Rees receive at the Comox Valley Farmer’s Market and other local festivals and events. For Vet and Rees, it’s all part of belonging to the vibrant Comox Valley community and providing great people with a great product. “We’re Island-made, and proud of it,” says Vet.